Guided Boring - Services - L.J. KEEFE CO. The GBM is best suited for line and grade critical crossings over long distances. Guided Boring equipment can be utilized as a stand alone system or in conjunction with Auger-Boring and Pipe-Ramming Equipment. Steel Casing Pipe - diameter range - 5/8" O.D. to 60" O.D. Also utilized for direct installation of small diameter Vitrified Clay Pipe (VCP) and No-Bell RCP. Ranging from 25 LF up to 500 LF depending on specified pipe material and anticipated ground conditions. The steering head, which is attached to the lead pilot tube, is able to thrust through most soils (i.e. clay, sand, or small gravel). A 2-pass method to install steel casing, which employs (1) the installation of a hollow stem pilot tube with a guidance system, and (2) a following steel casing which is jacked-in-place by an auger-boring machine while the soils are transported back to the jacking shaft by auger conveyance within the casing. If adverse soil conditions are encountered, the following steel casing can be rammed-in-place by a pipe ramming tool. 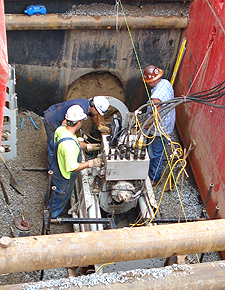 The guided pilot tube, the 1st pass, is installed by a hydraulically powered Guided Boring Machine that advances the pilot tubes while displacing the surrounding soil. Line and grade of the pilot tube's advance is continuously monitored by a theodolite optical guidance system. Steering of the GBM to maintain horizontal and vertical alignment is accomplished by the operator, who is viewing the advance of the pilot tube on the guidance system's monitoring screen, and adjusting the pilot tube's heading for an accurate arrival in the receiving pit. The casing adapter and first length of casing, the 2nd pass, is mechanically connected to the string of pilot tubes. As each length of casing is welded together and auger-bored/rammed in place, the pilot-tubes are being retrieved at the receiving pit.